Gathering the family together and preparing your meal on the 71 1/16″ Chagny 1800 must be similar to what climbers experience when summiting Mt. Everest. You are truly on top of the world in terms of performance, power and cooking flexibility. Two dual-fuel ovens are flanked on each side by a vertical warming cupboard. Add a compact yet powerfully efficient broiling oven and you have broken through the culinary cloud cover and peaked in terms of performance with three ovens. Includes a stepped array of up to nine burners (or up to eight burners and a cast iron simmer plate). 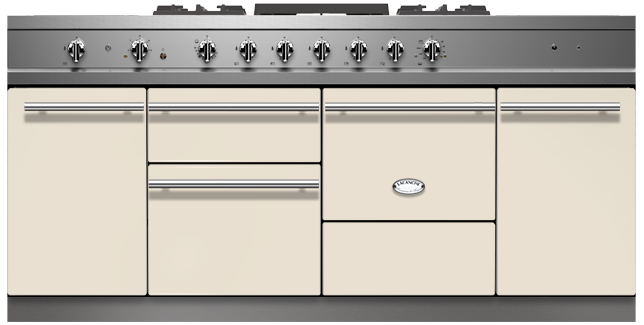 Click the button below to configure a Chagny 1800 moderne that is perfect for your kitchen. The Cluny-sized ovens found on the Chagny 1800 are 16w x 12h x 18d. The petite broiler oven is 16w x 6h x 17d. The warming cupboards are 13w x 20h x 21d. What are my oven options for the Chagny 1800? On the Chagny 1800 model, there are three ovens. Two Cluny-sized ovens, and one petite broiling oven. The petite broiling oven is electric, which automatically defaults the oven below to also being electric. You will have your choice between gas or electric for the Cluny-sized oven on the right hand side. The warming cupboards are electric. The Chagny oven seems small. What will my limitations be? The Chagny oven is smaller compared to traditional American ovens. The compact oven provides a more efficient use of space, concentrating the heat on the food instead of the empty space. You can fit a roasting pan with a 26 pound turkey inside! Standard-size cookie sheets, casserole dishes, cupcake tins and most dutch ovens will fit inside. The only potential issues you will have are with frozen pizzas and pastry sheets, however, we provide you with pastry sheets that custom fit onto your oven racks. Your choice! The petite broiling oven on the Chagny 1800 is electric, defaulting the Cluny-sized oven below to also being electric. However, you will have your choice to make the Cluny-sized oven on the right hand side gas or electric. *Convection is not an option for the Chagny models. The convection fan will take up 2 inches in the back of the oven, so we do not recommend convection for the Chagny models, as you will be losing precious space. Our matte black finish is considered to be standard, and all other color finishes, including stainless steel, are considered to be premium color finish upgrades. The color upgrade charge for a Chagny 1800 is $1600. A. For the Chagny 1800 model, choose an overhead canopy with the following optimum specifications: 80″ wide (86″ wide for Chagny 1800 island applications) x 24″-27″deep.